Phablets - large smartphones with screen sizes between five and seven inches - have become very common in the market. Phablets are particularly interesting for vision-impaired users because they offer a much larger display area than smaller smartphones. In this post, we present the test details, broken down into thirteen sections that cover aspects that are relevant for long-sighed ands vision-impaired users. Summary results and recommendations for the three user groups (long-sighted, zoom magnification users, and zoom magnification users with screen reader) can be found on the introductory page Phablets for low-vision and long-sighted users - summary. For each of the thirteen categories, a table shows the criteria included. The weighting applied to each criterion often differs across user groups and is shown directly below each criteria. The rating scheme follows a five point Likert scale from ++ (very good) to --- (very bad, or feature not exist). Both the iPhone 6 plus and the Galaxy Note 3 have a tactile home button. Pressing this button three times can start and stop the screen reader or zoom magnification, which is an advantage for users who need additional speech output depending on the situation (this function is rated in section screen reader). Physical buttons on a device are easier to find if they are not arranged at the same side of the device. This is a plus for the iPhone 6 and the Galaxy Note. The start button should be easy to distinguish from the volume buttons or volume rocker. They are easiest to tell apart on the iPhone. Still, on all devices, the start button could be more distinct for tactile operation. The mid position of the start button on the Lumia phablet is not ideal - it often leads to inadvertant activation. A negative point on the Samsung Galaxy Note was the fact that the navigation buttons to the left and right of the home button (menu und back) are not only without tactile trait (in this they resemble the navigation buttons on the Nokia- and Asus phablets) but also lack a permanent visual marking - they only light up and become visible when touched. The displays of the phablets compared have roughly the same size. The iPhone 6 plus and the Galaxy Note 3 have a higher resolution than the competition, but this is hardly noticeable and therefore wasn't reflected in our rating. More important is the brightness of the screen, especially for outdoor use. The iPhone has the brightest screen, closely followed by the Galaxy Note. The other two phablets are noticeably darker, the Asus Zenfone 6 having the darkest screen. Measuring the text size in settings, Lumia 12030 has the best default text size (13.5pt) followed by Galaxy Note (11.5pt). The Asus Zenfone 6 has just 9,5pt and the iPhone a mere 8 pt. Selecting the largest system text settings cranks up the text on the Asus Zenfone to 13pt and on the Galaxy Note to 14pt. The text on the Lumia 1320 is quite large by default (13.5pt), but doesn't get any larger when selecting the largest possible system text size. The iPhone text grows to a mere 9.5pt. Only the iPhone offers an optional bold rendering of system text that can compensate for the small text size somewhat. Still, the iPhone comes last in terms of the text size for system settings. Windows Phone is the only operating system that offers a strong contrast mode that shows a black-and-white view of the sytem tiles and inverted white-on-black views in apps like Mail. On desktop Windows 8.1, this contrast view is fully configurable, not so on Windows Phone. Both the iPhone and the Galaxy Note phablets offer colour inversion, but no explicit contrast setting. Inverted colours may also benefit some, especially glare-sensitive users, but poor contrast stays poor when inverted or turned into a greyscale view (an option available on the iPhone). When users chose inverted colours, images are also inverted which is usually not desirable, for example, when browsing web content. Windows Phone's contrast mode keeps images unchanged - on the iPhone and Samsung phablets, users picking inverted colours to get a white-on-black rendering of text have to live with faux-colours images. The built-in zoom is arguably the most important function for low vision phablet users. Here, the iPhone sets itself apart from the competition by offering more features. With iOS 8, Apple has introduced a permanently visible zoom control element that can be freely positioned. It allows the quick toggling between zoomed and unzoomed state and also the shifting of the visible section. Tapping it once shows a menu for calling up contrast views or displaying the zoom view full-screen or just in a window. This new control may not be a real game changer for low vision users, however. Its operation is quite fiddly - tests with low vision users will be necessary to establish to what extent it can be a real benefit. In our test, the availability of this control has therefore not been weighted strongly. Fig. 1: On the iPhone, the zoom control element can be activated to be permanently visible. It can be moved around to a convenient position. Tapping it twice toggles between default view and maginification view. Tapping once opens a menu for additional settings. In zoomed-in state, tapping and holding enlarges the control, directed dragging inside its circular boundaries shifts the magnified section. An important advantage of the iPhone zoom is the possibility to use the zoom function and the screen reader together. To be sure, Android also allows to operate both functions at the same time, but they are not integrated. On the iPhone, moving the focus position via swipe gestures automatically updates the visible section of the screen. This means that the currently focused element is always visible and does not have to be recovered by shifting the visible section. For low vision users who require additional speech output, the iPhone is therefore currently the only device that can be recommended. However, these extra iPhone zoom features do not necessarily translate into a better zoom experience for users who do not use the screenreader. The operation of the Android zoom function is as good or better as on the iPhone. Android's pinch gesture for changing the zoom level is simpler than the double tap-and-drag gestures used on iOS and Windows Phone. On top of this, Android has what may be called a "spot zoom" - a quick triple-tap shows a magnified view of the tapped position, with the option to slide the finger to move the magnified section. Magnification reverts to the normal view once the finger is lifted. We know from user testing that many low vision users like this feature, which is absent on the iPhone. Windows Phone has the worst implementation of zoom magnification. Our test device reacted sluggishly to gestural input. When changing to other views in magnified state, the new view is presented with the same relative position of the magnified section as on the previous view. This often means that the user lands in a 'sea of black' (or sea of white) and has to re-orient herself by moving the magnified section to some island of content - or by zooming out, then zooming in again. Both iOS (focus on centre-top of new views) as well as Android (revert to unzoomed view) have found a better solution. Another serious drawback is that under Windows Phone, zoom and screen reader do not work together at all - when the screen reader Narrator is activated, the zoom function is automatically disabled. In terms of configurability of the home screen, both Android and Windows Phone phablets trump the iPhone. While Android has widgets and allows free positioning of icons with gaps for better grouping, Windows Phone has live tiles which can be changed in size (within given size types) and grouped to users' liking. Regarding the size of icon labels, all devices could offer larger text. Android's 8.5pt is already the largest, Windows phone tile labels are just 8pt and the iPhone labels measure a meagre 7pt (but here, labels can be rendered bold). The simple mode on the two Android devices remedies that somewhat by cranking up icon sizes and label text size to 11.5pt (Samsung) and 11pt (Asus). The iPhone's magnified display setting magnifies icons slightly, but leaves labels at the same small size. The search input on the iPhone appears when swiping down from the top edge and haslow contrast. Speech input via Siri also works and operates well with the screen reader VoiceOver turned on. Samsung and Asus also have search widgets that can be positioned on the home screen. Home screen icons are read by the respective built in screen reader on all devices. The Asus search widget is not properly labelled and unusable with Talkback on. Narrator on Windows phone (remember the device language has to be English for Narrator to work) fails on the separate Bing search interface, with not properly labelled or inaccessible controls. The telephone dial pad is certainly not the stand-out feature of a modern smartphone, but it should have good contrast and key size nevertheless. While all dial pads tested have accessible names for screen reader operation (apart from some deficiently labelled controls on the Asus Zenfone), visually the iPhone dial pad has the poorest implementation for low vision users. The letters associated to numbers are tiny, the controls lack contrast. Samsung's dial pad is the best in terms of visual characteristics. The virtual keyboard is essential for an active use of a smartphone. All smartphones tested would allow for larger keyboard characters, which would make the life for low vision users a lot easier. This is particularly evident on the Windows Phone keyboard which has 9.5pt small (non-capital) letters. An optional system setting to display larger characters on the virtual keyboard would be beneficial for low vision users. Visually, the Asus keyboard can be considered the best with 12pt small semi-bold characters on large well-defined keys, and word suggestions with good contrast. The Samsung Galaxy keyboard has smaller keys with slightly larger and bold small letter characters (13pt) and a white-on-dark grey scheme with slightly lower contrast than the Asus. Key characters on the iPhone 6 plus are a lot smaller (10pt bold), word suggestions and the keys shift and backspace have poor contrast. Keys on the Lumia 1320 are large, but not as contrasty as on the Asus phablet. And the characters are just too small - there's loads of space to render them much bigger. Fig. 2: The virtual keyboards in comparison. From left to right: Asus Zenfone 6, Samsung Galaxy Note 3, Apple iPhone 6 plus, and Nokia Lumia 1320 (activate / click on image to get a larger view). When the Android screen reader Talkback is on, the Samsung keyboard allows input by selecting keys via touch-explore, then double-tapping. This differs from the stock Android input method of typing by lifting off the finger, which is arguably quicker and therefore more convenient. The iPhone offers a choice between different input methods: Standard Typing (selected key is written by double tapping or split-tapping), Touch Typing (writing by lifting off the finger as on stock Android) and Direct Touch Typing, which writes immediately - possibly useful for people who see enough to get the finger position right. We found a big fail with the Asus skin ZenUI: The virtual keyboard provides no output to the TalkBack screen reader. Typed keys are spoken once typed, but not on touch-explore. This defect alone makes the Asus Zenfone pretty much unusable for anyone requiring additional screen reader output. There might be custom keyboards that users can install instead of the default keyboard which might remedy this defect, but checking this out this was not within the scope of our review. The Samsung phablet or one with stock Android (like the new Nexus 6) is preferable for low vision users needing screen reader output. When comparing the default e-mail clients, we find a strong showing by the Windows Phone client which has the best default size and strong contrasts. The mail app honours system text size settings, and elements get larger in a more uniform way than on the other devices. 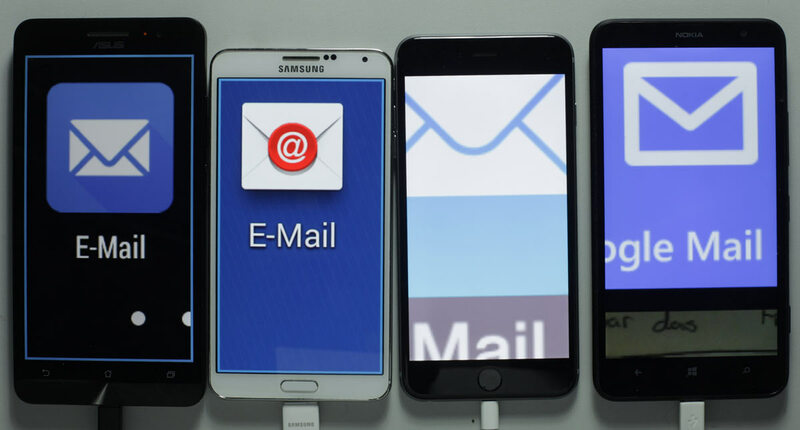 The Samsung mail client also allows large text and has app-specific font size settings that include "huge", which shows mail text at a whooping 31pt. The icons of controls (reply, forward, etc.) are clearest in the Asus mail client but here, mail text viewed in landscape format with the largest system text size is cut off and does not wrap. For many low vision users, the largest system text size setting may not be large enough. But on the Android Phablets and on Windows phone, mail content can be resized via pinch zoom. A big drawback on the iPhone is that mail text does not reflow after applying pinch zoom, as it does in the other three default mail apps. Visually, the Asus has the best control icons (reply, send, new mail). Where it falls over is the lack of accessible names for screenreader users. Another proof that low vision users who need additional screen reader output should steer clear of the Asus Zenfone 6. Regarding the calendar apps, the Asus Zenfone calendar has generally the best visual interface regarding the size and contrast of elements, but is let down by the event time setting. This happens via a circular control also found in the 'vanilla' Android default calendar app which is difficult to use due to very small figures and bad contrast. The Samsung calendar is therefore better overall despite its own deficiencies.The Windows phone calendar has good contrast, but has tiny dates in the month view (just 7.5pt) and small labels as well as small placeholder and content text when creating new entries. The iPhone calendar also has small text controls and contrast issues. Both the Asus calendar and the Windows Phone calendar fail when screen reader output is required - the accessible naming of controls is incomplete. Here, the iPhone calendar has the best support (complete accessible names for controls) for users requiring additional screenreader output. The Samsung calendar has gaps in naming and focusability: using it via the screen reader is possible, but very cumbersome. Arguably, the browser is the most important app on a smartphone since it is a window to web content and the engine to run numerous web apps. In our test, we have focused on the default browser. Including other browsers would change the result. Chrome is an obvious alternative to the default browser - on Android and now also on the iPhone. Going by the selected criteria, both the Samsung and the Asus default browser top the iPhone's Safari and IE on Windows Phone. Both Android browsers contain app-based features like text resizing and contrast modes that are lacking in Safari and IE. With regard to test resizing in the browser, only Asus offers a dynamic reflow of text when using the pinch gesture to zoom in. Other Android browsers like Dolphin (not tested here) offer the same feature. An important browser feature for low vision users is the reader mode. The browser readers on the iPhone, the Galaxy Note and the Zenfone are quite good and allow scaling up of text via reader text size settings (iOS) or pinch zoom. The reader in Samsung's browser has a night mode offering colour inversion while keeping images intact. This partly compensates for the fact that the system level colour inversion also applies to images. IE disappoints with a reader that has a maximum text size of just 10pt. If you think pinch zoom might help, the IE reader does not offer a reflow of text, making its use unsatisfactory when text is magnified. IE shows a strong screenreader performance, especially considering that Safari under iOS 8 is beset with a very buggy behaviour (compare the recent article by Marco Zehe: Apple are losing their edge also in accessibility quality). Talkback on the Samsung browser seemed relatively stable, not so on the Asus default browser. Speech input is an important function especially for those low vision users who find using the virtual keyboard difficult. Regarding speech input, the results are very clear: the iPhone offers the best performance. All devices except the Nokia Lumia 1230 offer speech input over a longer period, accepting several sentences in one go. The Lumia phablet aborts listening after about 10-12 seconds, meaning that longer input has to be provided in chunks. This is quite annoying. The situation may be different on higher-performing Windows Phone devices. Regarding recognition quality, the iPhone also leads the pack. The Android devices get it wrong more often (...sich den... was interpreted as sechzehn by both the Samsung and the Asus device). The situation may be better when using the English language – we tested the function with devices set to German. The iPhone also has the best capitalisation. The Windows phone is apparently not able to interpret punctuation during (German) dictation - it just writes out "Komma" and "Punkt". In this test, the screen reader counts only for the group of low vision users using it in addition to visual use. Our rating is admittedly rather coarse here and does not differentiate screen reader operation in terms of gestural input, verbosity options, availabie navigation settings, etc. When summarily comparing output quality and operation, Apple's VoiceOver is still the most polished screen reader (but take note of the iOS 8 / VoiceOver bug reported in section Default browsers). The Asus phablet has a somewhat awkward combination of pressing the home button and leaving two fingers on the screen until a voice feedback appears to confirm activation. Turning TalkBack off is then only possible via the settings. The activiation command documented for Narrator on the Lumia 1230 (hold volume-up button, then press start button) did not work in our test. The speak screen function is different from the screen reader. It is currently only available on iOS. When activated, it speaks the current page content. It does not support interaction or input like a proper screen reader. Fig.3: Apple's speak screen function, once activated, can be called up by swiping down with two fingers from the top edge of the display. The turtle and hare controls slow down and speed up the speech output. There is an option to progressively highlight the currently spoken text (here, the words Griechen-Streit are highlighted). This highlight could have better contrast. After a short while, the control element shrinks to the arrow at the top left so that it does not cover too much screen content. One tap expands it again to the size shown (activate / click on image to see magnified). In contrast to turning on a screen reader like VoiceOver, TalkBack or Narrator, the Speak Screen function does not change the normal gestural interaction mode. For low vision users, the ability to hand over to speech output to relieve the eye or listen to text while a focus traverses the text as it is read is a welcome addition. On the iPhone, the Speak Screen function offers settings for changing the reading speed as well as pause and resume buttons. Users can mark the place where reading should start. A problem when the Speak Screen function is turned on is that the usual home screen gesture for calling up the search input field no longer works (swiping from top edge of the screen).